It's hard to imagine a less top heavy college football season. While I have no issue with the final four teams selected, the discrepancy between those 4 and the rest of the top 10 is very minimal. Take Iowa, who played Michigan State to the brink, or Stanford, who dominated the Pac 12 and beat Notre Dame. Then there's Ohio State, who as much as it pains me to say it, lost once and then whooped buzzworthy Michigan. Or even Notre Dame, who had a sick schedule and lost two games by two points each, to the #1 and #6 team in the playoff rankings! You can't tell me any of these four teams couldn't beat any of the top four. We need an 8-team playoff now! But, I digress. We have a four team playoff, and that's better than the Big Cowards System, or the BCS. In the end, we have four very good football teams, who should give us plenty of excitement and competition on New Year's Eve (Yes, not New Year's Day! Why, oh why?). Here's my breakdown of the final four, and my predictions! People need to put the Clemsoning and the Clemson choking persona to rest. Clemson is 13-0, has three top 10 wins, a very good, if not elite D, and the best dual-threat QB in the land. People want to knock their conference, but FSU and UNC are 9 and 10 in the rankings respectively, and they beat them both. This team is incredibly balanced, well-coached with Dabo and has a fanbase ready to lose their minds. Did you see the 20,000 that packed the stands for Dabo's free pizza day during their playoff announcement? The fans are ready, and this team is ready to fight for it all! The SEC was pretty bad this year. And, as an SEC guy by default (a team I won't name who used to be in the Big 12), it does pain me to admit this. You have a bunch of underperforming teams, and then you have Bama. It's hard to evaluate Bama because they didn't schedule a big out-of-conference game (Wisconsin no longer counts). But, let's try! They certainly have the O line and the RB in Henry. No shocker there, and I think he gets the Heisman, although I'd love to see a co-Heisman with McCaffrey. You have a good Bama D, but not great. And, you have a pretty weak QB in Coker. It's a recipe for mixed results in a playoff format. More to come, but this isn't your typical Bama team. Saban "the devil" can only do so much. Aside from Connor Cook pushing aside Archie Griffin, there's a lot to love about this Sparty squad. Cook stuck around for his senior year and is very clutch, their D singlehandedly won them the Ohio State game and kept them in the Iowa game, and Dantonio is a whale of a coach. I love that Sparty was put at 3, and OU was 4. This will be the most debated part of the playoff, which is much better than the debate over snubbing a team like last year. Michigan State played in by far the best conference this year, and won it. Their only blemish was a one-point loss in Nebraska, but more than made up for it with the miraculous victory in the big house and a win at Ohio State without Cook, perhaps the most impressive feat in the entire college football season. Hats off to you Sparty! This team was the dark horse of some analysts. After the bad loss to Texas, things looked bleak. But, in college football, everything is about timing and results. OU's loss to Texas came nearly two months ago, giving them time to play their way back in the mix, with their three toughest tests coming at the end of the season. That said, the big 12 was stricken with QB injuries like I've never seen before. So, how do we evaluate this OU team? Let's start with the QB. If there was one thing I was most shocked about to start the season, it was OU's choice to bench Trevor Knight and start Baker Mayfield. We're talking about benching a guy who defeated Bama in the Sugar Bowl as a redshirt freshman. And, we're also talking about a walk-on in Mayfield! To even have a QB battle for the starting spot is gutsy by Stoops. At first, I thought it was just politics. Then, I couldn't believe it! So, you have a warrior in Mayfield, a very good running back and a solid D. Top to bottom, I think OU is the second-best team in the final 4, but I think their ranking is appropriate. It just so happens that I think Clemson is the best team at the moment, and they're OU's opponent in the final four. Let's start with Clemson-OU. As I mentioned, I'm higher on Clemson overall. This should be a heck of a game. I definitely don't see a blowout. I see Clemson taking it 30-27. In the other semifinal, it's Bama-MSU. You may be surprised by my pick, but I'm going MSU. Bama's biggest strength is their running game, but that won't come easy against Michigan State. MSU's defense is for real. This game should be somewhat close, and it comes down to one thing for me: Cook is light years better and more experienced than Coker. Game on the line, one guy is making plays and the other isn't. Also, MSU might just have the better D. Give me Sparty 26-17. Now, to the final. This one is tough as nails. You have two of the most balanced, well-coached teams in the country. Dabo vs. Dantonio for all the marbles! Can Sparty come out of nowhere and take the ship like Ohio State did last playoffs? Or will smooth and steady Clemson win it all? Rankings are subjective, but do I go chalk or do I go out on a limb? I'm going to pull a George W. Bush and take Clemson. I've been high on them most of the season, and there's no reason to back off now. Give me Clemson 30-22. Off the heels of an amazing sports weekend and ensuing two nights, in which the Cowboys pulled off a miracle, the Rangers grabbed first place and I won my 2nd straight basketball championship in the old farts rec league, it's time to reflect on week 1 of the NFL. When you watch a lot of Jason Garrett, it's easy to devalue coaching. But, good coaching seemed to be the prevailing takeaway from week one. Look no further than former Seattle defensive coach Dan Quinn, now head coach of the Falcons. Quinn did a complete 180 with that Atlanta defense in week 1, which contained and even at times dominated the hyped Philly offense for much of Monday night. Then, there's Eric Mangini, the defensive coordinator for the 49ers. A team with more retirements in an offseason than I can remember, Mangini's niners held an upstart Vikings team to 3 points on Monday night. Is it a coincidence that he was on those vaunted Patriots defensive staffs? I think not. The last coach I want to give props to is Jeff Fisher. Often forgot about, and perhaps remembered most by my generation for his controversial situation with Vince Young in Tennessee, Fisher led the Rams to an impressive overtime victory over Seattle on Sunday. There's a reason this guy has been a coach in the NFL for 30 years. With an elite defense and finally some playmakers on offense, now might be the time for Fisher to get back into the spotlight and lead the Rams to future success. Over the last 3 seasons, everyone has wavered from picking the Broncos to 100% win the division to marking a certain season as Peyton Manning's downfall. As Manning gets older and older, it's hard to imagine he can keep up the pace of extraordinary stats and play on the field, but he has proved the naysayers wrong so far. That is, until maybe, right now. I don't want to make too much of week 1, but he looked mediocre against the Ravens. Now, some of that certainly is attributed to an inexperienced offensive line, but regardless, the man is 39 years old and doesn't have feeling in some of his fingers. So, as we begin to think about who will be the future of the AFC West, many previously thought San Diego, with Rivers. However, the new prevailing thought seems to be Kansas City, and for good reason! 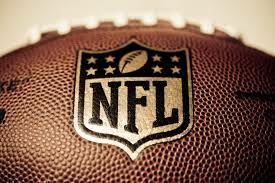 Their defense has some big-time, All-Pro playmakers, their offense finally has some additional talent at the skill positions and they have a mastermind of a head coach. Alex Smith is good for this team and can certainly lead them to playoffs, but it will be tough for them to go very deep because he can't throw the long ball. However, they have the pieces in place to make it possible. Only time will tell, but their week 1 showing and recent progress in the last couple years lead me to believe that they the present and the future of the division. It's almost unfathomable to me just how often teams mess this up. You prepare for hours and days for a game, play almost the entire game, and then lose it on one poor decision or a complete screw up on clock management. Both happened for the G-men on Sunday night. It's usually my Cowboys who are doing the gifting, but not that night. In just one play, the G-men saved the Cowboys very valuable time, points and yardage that allowed them to miraculously win by 1 point, when Romo connected with Witten for a TD with 7 seconds left. In my mind, clock management and play calling is what separates the good from the bad, and even the good from the great. Some of it is human nature, but some of it is just flat out inexcusable. Many will pick New England to run through the division again, and for good reason. But, watch out for the Dolphins, Jets and Bills. All won Sunday, with the latter two winning in blowout fashion. All 3 also improved by leaps in bounds in the offseason, just in terms of the stars and potential superstars they acquired. Rex Ryan getting out of New York and going to Buffalo helped both teams. He is one of the league's best defensive minds, and he inherits a better, and dare I say, elite defense. On the other side, New York gets a fresh start with Revis and Cromartie back, and Ivory getting to run over people in volume, something Rex Ryan didn't allow for before. As for Miami, they didn't look great against Washington, but many believe they are the most talented of the three, and the best candidate to knock off New England. This should be a very interesting division now, and for years to come! If Sunday proved anything, it's that predictions are just predictions. Maybe they come to fruition, or maybe we need to step off the gas. The hyped Eagles and Cowboys didn't look very good, and neither did Miami and Indy. Week 1 proved that it truly is a new season, and maybe, not a predictable one. From Mariota playing well, to Buffalo upsetting Indy, to St. Louis shocking Seattle, and everything in between, it truly feels like a fresh start. And, hey, a little parity never hurts! For those who don't know, the JCC Maccabi Games is an international Jewish sports tournament that sees teens ages 13-16 (12 if you're in an individual sport in your host city) compete in about a dozen team and individual sports every year, ranging from basketball to dance. Having participated for four years, I was humbled and honored to be asked to come back as a coach this August, as Dallas was one of three cities to host this year's games. I had the pleasure of coaching a dozen kids/teens as the Star Reporters coach. It was a full circle experience that brought back so many memories. As they played in my mind throughout the games, one prevailing thought kept entering my head: this week is really about everything beyond the actual games. Sure, each sport competition is thrilling, and the pursuit of a medal through body-jolting athleticism is alluring, but this special week of Maccabi is really about everything else. And, I think my great group of star reporters started to catch on! What Maccabi is really about is the friendships Jewish teens make during one week that can last a lifetime, the Midot Medal handed out to coaches or players for exhibiting great sportsmanship and Jewish values, and the incredible amount of time and effort put forth by coaches, volunteers, JCC staff and the community to create a bond that has to truly be experienced to be felt. It's those stories that make Maccabi: the host families that take in a group of Jewish teens for a week, an Autistic boy I met who medalled in swimming, and for me personally, the way 12 teens responded to my guidance and how proud they were of the work they did. With so many camps and options for Jewish teens, it's easy to not give Maccabi a second thought. But, I am here to tell you that Maccabi is a once-in-a-lifetime opportunity that everyone should experience. To see all the great work that the star reporters did, click here! Make sure you also click on the printed versions at the bottom of the page. On this Sunday night, it didn't matter if you loved soccer or hated it. It was Fourth of July weekend, and the USA Women's soccer team was in a déjà vu position – the World Cup Final against Japan. Beating Japan two years ago at the Olympics was one thing, but avenging their 2011 World Cup loss to Japan was completely different. And, doing it in the fashion they did can only be described in one word – epic. A flurry of four USA goals in the first 16 minutes sent the U.S.-dominated crowd into a frenzy in Vancouver. 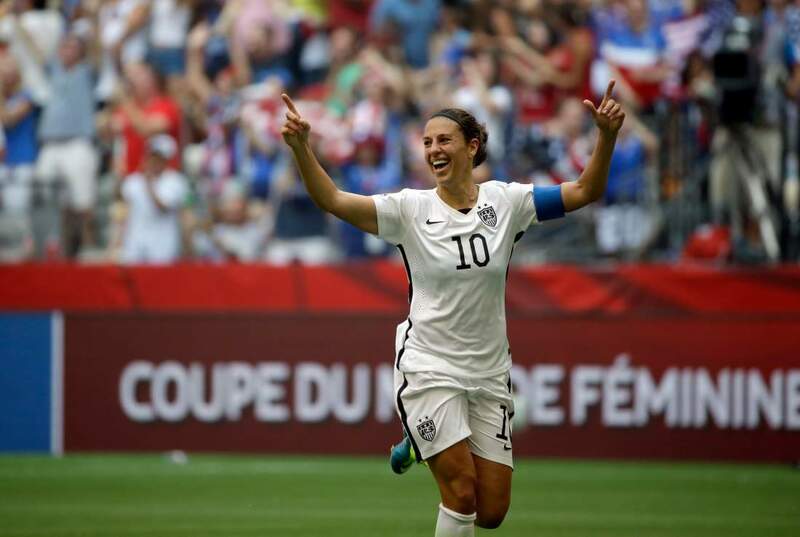 Not only that, but we also saw an other-worldly performance from Carli Lloyd, who struck a hat trick, capped off in the 16th minute by one of the most exciting goals you will ever see from midfield! I don't care where you rank this performance/moment in sports history –and there have been some amazing plays/feats over the years, from "The Catch" of Montana to Clark in the 1982 NFC Championship (I know, it still stings! ), to the Cal-Stanford play, to "Jordan's last shot," to Phelps winning 8 Gold Medals, to the 1980 USA Hockey team beating the Soviet Union in miraculous fashion – this performance by Lloyd and her final goal has to be a part of the discussion. Maybe, I'm overreacting. Or, maybe, this was just the performance to get people to finally appreciate women's soccer. 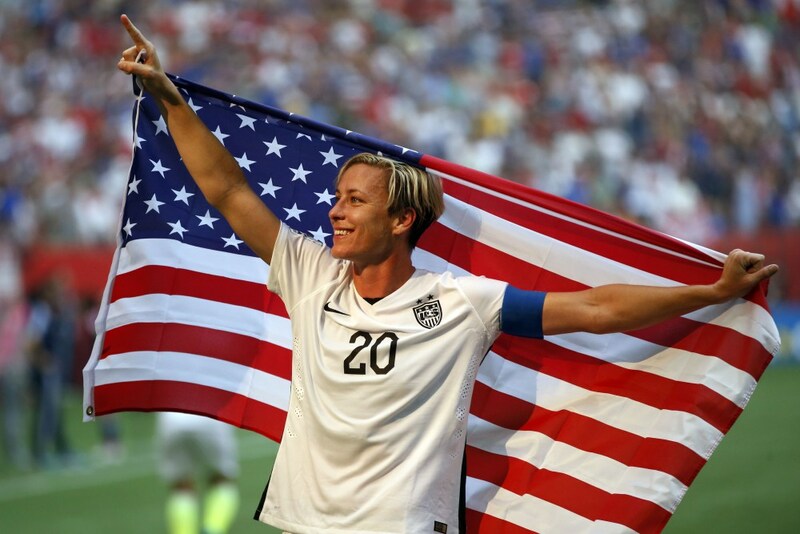 In the midst of the chaos that circulated across U.S. bars and homes throughout the country, the legend Abby Wambach entered the game in its final stages. The game was already in hand, but maybe this was fitting. Wambach, who arguably carried the team and U.S. women's soccer for more than a decade, entered her World Cup swan song knowing she finally did it, helping get the USA that elusive World Cup, and first since 1999. Having been the heart and soul of U.S. women's soccer for so long, it was a fitting passing of the torch to players like Lloyd, who looks to most certainly be capable of carrying it far into the future. And, it was an exit fitting to Wambach, who may not be the best player in USA soccer history, but certainly one of the most clutch and inspirational. Legacy vs. legitimacy. The King vs. the MVP. Starved city vs. Dub City. 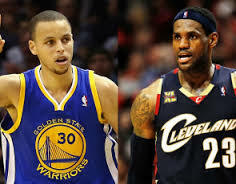 These are the respective scenarios when LeBron James leads a starving, title-hungry Cleveland town into the finals against emerging superstar Stephen Curry and the 67-win juggernaut Warriors. From superstars to insanely passionate fan bases, it is one of the best match-ups the NBA could have hoped for. So, without further ado, let's break down some of the keys, the story lines and conclude with a prediction. LeBron James is one of the most polarizing NBA players in my generation (top 3 with Kobe and AI). You either love him or you hate him. You likely embraced him in his first 7 years in Cleveland, cheering for him against the likes of Boston, Detroit and San Antonio, in an underdog-against-the-world mentality. When he bolted for Miami, you probably hated the villain. And now, NBA fans are left to decide what side to choose, now that he's back home. No matter where you reside or what team you support, you know LeBron is one of the all-time greats. He's done more in his 20s than virtually anyone, and his greatness is hard to question. But, the great thing about a legacy is that it can always be amended. Add to the fact that it's a sport legacy in the all-time record books, and you have a story line and debate that is off the charts! If LeBron can win it all for Cleveland in his first year back, going up against a truly great all-around team in Golden State, his legacy will be immortalized. It will be pretty hard for the haters to legitimately bring up 2011 against Dallas if he reaches the mountaintop this year. And, while I don't think he is better than MJ, he certainly would cement validation that he belongs in the upper echelon of the conversation. Just think, the way people put Jordan on a pedestal and talk about his greatness years after his career could be the same thing with LeBron when it's all said and done. It seems like Stephen Curry came out of nowhere. Sure, he had a good season last year, but a finals appearance never crossed anyone's mind going into this season (at least not mine!). Who knew that this super thin sharpshooter from a small college in North Carolina would rise to the top of the league in just six seasons, and take on the giant in LeBron James for the whole enchilada? And, unlike LeBron, it is really hard to dislike the man. He is an easy-going guy, great family man and a joy to watch on the hardwood. He can literally shoot from the arena tunnel, drive and finish like nobody's business, and cross you over with ridiculous handles. While the future is limitless for him, it will be great to see Curry vs. Lebron for all the marbles! Can a Jump-Shooting Team Actually Win It All? This is a topic that many have debated over the years. We've seen them all come and go with a feeling of emptiness, from the Sacramento Kings in the early 2000s, to the Dallas Mavericks with Nash, Finley and Dirk, to the Phoenix Suns with Nash. The belief behind the failure was that these jump-shooting teams would eventually miss and not be able to win in the typical, grinding half-court style of the playoffs. And, another reason was that a lot of teams that exhibited this style of play weren't good defensively, a situation that saw these quick, long jump shots leading to fast break points for the opponent. But, times have changed! Most teams are shooting the long ball at a high rate, and more importantly, Golden State is actually very good defensively. Not only are they number one in defensive efficiency this season, but they also have terrific individual defenders in Bogut, Green and Thompson. They can most certainly win it all! By the looks of it, we have two top-notch defenses with one superstar on each squad. Golden State is clearly the deeper and more talented team here. Add to it the fact that Kevin Love is gone, and Kyrie Irving is banged up, and that makes matters worse for the Cleveland faithful, looking to win their first ever title. Some will argue that Love's absence has been a blessing in disguise, but you can't debate Kyrie. He is a top NBA talent, fantastic playmaker and rising star. Considering LeBron will have to play out of this world to win it all, Irving will need 30+ and Cleveland doesn't have the home court advantage, the pick is easy to me. Give me Golden State in 6. Enjoy the finals everybody! Amidst all the injuries and a mostly forgettable opening round to the playoffs, NBA fans were left wondering if the insipidness would ever end. Then, game 7 hit, and it has been nothing short of amazing ever since. We often don't think about it in real time, but it's astounding how one game or one play can change the legacy of a player/team and the landscape of the entire playoffs. In that epic game 7, it looked like the Spurs were destined to move on and not relinquish the throne. It looked like CP3 would once again fall short. But then, hobbling on a hurt hamstring, Paul emerged as the hero, hitting a very difficult shot over Duncan to seize game 7 from the Spurs. And, the buck didn't stop there! Last night, LeBron was the latest last second extraordinaire, hitting a buzzer-beater that perhaps changed the fate of the entire playoffs. And, who can forget the buzzer-beater bankers from Rose and Pierce, the latter of which produced maybe the best impromptu one-liner, on-court interview in sports history? How the rest of these playoffs will shake out is anyone's guess. In a sport that is typically predictable due to a best-of-seven format and select superstars, it has been refreshingly unpredictable this go around. Will the top seed Warriors come back to beat the blue collar Grizzlies? Can Chris Paul finally reach the finals and win? Can the Wiz top the Hawks without Wall, and will he come back at any point? And, for that matter, who will be healthy in the Bulls-Cavs series, and how will both teams respond after consecutive buzzer-beating outcomes? Time will tell, but the story lines and finishes have been utterly incredible. I realize not everyone cares about tennis, but that won't stop me! It's always been one of my favorite sports, and I get excited any time a major rolls around. Nadal has been virtually unbeatable at Roland Garros, but with many questions surrounding his game lately, will this be the beginning of the end of his career? As sad as that sounds, it's a realistic question with all the injuries. It would be something if my favorite athlete of all time, Roger Federer, could win another major! Horse racing is another sport where not everyone will gallop to their tube to watch. But, the real enthusiasts and sports bettors know that this is a can't-miss event! More importantly, can American Pharaoh win again, and set up the elusive triple crown opportunity at Belmont? Strap in; it's going to be a wild ride! It's a shame how far this sport has fallen in America. And, I admit, I'm one of those people who fell along with it. But, with Ovechkin or the NY Rangers guaranteed to make the conference finals, along with the juggernaut Blackhawks and the upstart Ducks, it should be a hit! Don't forget about the other epic events this May! A car race in Qatar and the European Championships of Rowing, just to name a few. And, here you thought the summer was only about baseball! Here's to a great month of sports. Enjoy! As we near the end of April, much will be made about each team’s early season performance, both positive and negative, by fans and media alike, as is the case every year. Unfortunately, what gets lost in this instant reaction and evaluation frenzy is the context that there are roughly 150 more games to be played on the schedule for each team. The 12-game sample size that April has given us simply isn’t enough to make more than surface level observations and critiques, barring significant injuries or roster overhaul. Thus let’s get to 3 of the more common overreactions floating out there and either debunk or justify their validity. Overreaction #1: The Boston Red Sox are about to pull off another worst to first finish! Whoa. With that rotation? In that Division? It’s fair to say the Sox have looked good early on, despite not getting full production from their heavily invested offense. Offseason acquisition LF Hanley Ramirez has provided much needed power, though not much else, while 2B Dustin Pedroia looks back to 2013 form after a down year last season. The offense will score far more runs than the paltry 634 it put up a year ago, simply because of talent on the roster and the relative ease of hitting at Fenway or nearly any other AL East ballpark for that matter. This should afford them the chance to finish in the top 3 in the AL East. The pitching and defense is where we must temper expectations in 2015, barring a significant addition or unforeseen breakout season. The rotation, consisting of Rick Porcello, Justin Masterson, Clay Buchholz, Wade Miley and Joe Kelly, is something out of a bad horror movie. Buchholz is the only one who has performed at a high level for more than a single season, yet has never done it in consecutive seasons (a trend he will not be starting this season). The defense has been subpar with 9 errors to their name already. The bullpen is solid when Koji Uehara is healthy, and is anchored by the reliable Edward Mujica, Craig Breslow and Junichi Tazawa. Overall, it’s safe to say the Red Sox will be competitive as long as their rotation allows them to be. They’ll score enough to remain in the upper echelon of the ultra-competitive AL East, yet will struggle to contain teams like the Orioles and Blue Jays to the point where winning the division is no guarantee. However, I believe that the Red Sox will head into the final week of the season with a chance to complete the worst to first cycle again, simply because they have the means to upgrade as the season progresses and that division is a mess. Overreaction #2: The Chicago Cubs are for real and will qualify for the Playoffs! Never say never, but the Cubs? This isn’t a drunken phone call from a night out in Wrigleyville is it? As farfetched as it sounds, this overreaction does have some legs in that this is the best outfit the Cubs have trotted out since Lou Piniella’s forgettable, but solid 2009 squad. Coincidentally, they’ve been unable to break the 700-run threshold since that season, which is something that should change in 2015. Second year RF Jorge Soler has provided the offensive spark to makes that a possibility with his pop. First baseman Anthony Rizzo and SS Starlin Castro have also been highly effective early on. The call-ups of prospects, Kris Bryant and Addison Russell, should only further push their ability to put up crooked number innings. For the first time in a long while, the offense is suddenly not the detriment of this team. On the pitching side, the Cubs seem to have struck gold with former starter outcasts Jake Arrieta and Travis Wood. These guys have spent time towing the line with the Cubs in recent down years, and it seems to finally be paying off. Big fish offseason signing Jon Lester has been terrible in his 3 starts thus far, which exemplifies a case where two things are likely equally true. First off, Lester was vastly overpaid for his skill level after taking advantage of a career season in 2014, and expectations are too high. Secondly, despite his price tag, he will more than likely bounce back and help balance out this rotation as the season progresses. The rest of the rotation will need it, as Jason Hammel has been terrible since July of last season and Kyle Hendricks is a young project. The bullpen here is decent but sort of non-descript, aside from the ever-improving Pedro Strop. Look for the pitching to flash brilliance at times, while coming back to reality against the elite offensive teams on the schedule. Ultimately, the fate of the 2015 Cubs will come down to pedigree, experience and talent, which is something rival St. Louis Cardinals has more of in all facets of the game. Expect the Cardinals to win the NL Central, which will force the Cubs to have to focus on procuring one of the Wild Card spots. 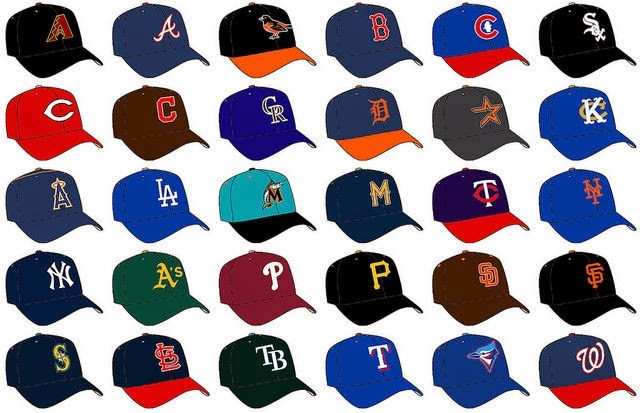 They’ll be in the mix along with the Braves, Padres, Reds, Pirates and Mets. but likely will be on the outside looking in come October because of their inexperience and lack of depth. Overreaction #3: The Milwaukee Brewers are the worst team in baseball! From being the second best team going into the All-Star Break in 2014 to holding the worst record in all of baseball, the slip has been astonishingly bad for the Brewers. The offense, which is not completely devoid of talent and once looked explosive, has been totally lifeless thus far. In short, they’re overpaying that PED hack RF Ryan Braun way too much money to not produce and relying far too much on elderly 3B Aramis Ramirez. They don’t get hits, they don’t get walks and they’re incapable of stealing bases, none of which gives much hope of an ability to score something they’ll need to make up for their inferior rotation and fielding. The silver lining again, though, is that there is talent and it’s early. Eventually, some of the bats will heat up, but will it be enough? Their rotation just isn’t very good, unfortunately. First off, they traded their best SP Yovani Gallardo to Texas for prospects and did nothing to attempt to replace his production or consistency. The combination of Matt Garza, Kyle Lohse, Mike Fiers, Jimmy Nelson and Wily Peralta just isn’t inspiring, despite Nelson’s hot start. The fielding has been equally frustrating and the source of a lot of unnecessary runs allowed. That will be a theme for the Brewers in the early innings this season, as their starters are mostly all high ERA guys. On a positive note, the bullpen is one of the most consistent in baseball and a source of strength. Closer Francisco Rodriguez has put up some of his best numbers in Milwaukee, and relievers Jeremy Jeffress and Tyler Thornburg are solid. The paradoxical composition and performance of the Brewers pitching staff in 2015 will be something to watch, and then immediately after, scratch one’s head. In spite of all of the well-documented negatives surrounding this team, from the struggling offense to the lack of quality starting pitching, the Brewers do have what it takes to bounce back from this horrendous start. There’s simply too much offensive talent and bullpen strength to believe that his team will lose 100 games. Thus, they cannot and will not be the worst team in all of baseball by the time this season is over, despite the early failures. Look for the Brewers to struggle most of the season and still finish in last place in the NL Central, but at least make it interesting at times. We are just three days into the postseason, but it already feels like the first round won't be quite the classic we saw last year. Nevertheless, I'm here to tell you that the story lines far exceed those from last year! Take, for instance, the predictability factor. I know hindsight is 20/20, but a lot of people saw a Spurs-Heat collision course, and that's exactly what we got. This year, the jury is still out, and I see a handful of teams with a reasonable chance to hoist the Larry O'Brien Trophy and etch their name in basketball immortality. Who would have thought Golden State and Atlanta would be the top seeds? How about that for unpredictability? Let's start with the team that is so easy to root for. Golden State went from a 51-win six seed to a 67-win juggernaut, topping the entire league. And, they did so through a coaching change. Seriously, who does that? But, while Steve Kerr has been just what the doctor ordered, credit must be given to his two top assistants, Alvin Gentry and Ron Adams. They are the unsung heroes of the staff, and maybe, the team. That said, many of the players could also make the same claim. The Warriors are truly one of the deepest and most talented young teams I've seen in some time. 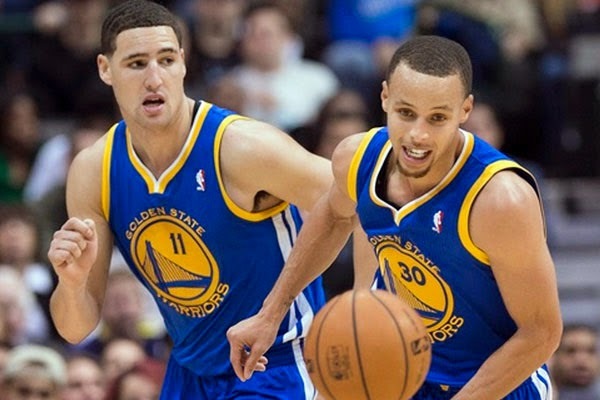 They're led by the "splash brothers" duo of Curry and Thompson. Heck, remember in the offseason when some NBA fans thought they should deal Thompson for Kevin Love in a multi-player deal. I admit, I was one of them! But, boy was I wrong, as evidenced by Thompson's record-breaking 37-point quarter earlier this season, and his 26-point performance last night. Then, there's Draymond Green, who took over David Lee's starting spot due to injury, and hasn't looked back. Almost matching Green's versatility is big man Andrew Bogut, one of the best passing and defending big men in the game. Throw in a bench full of speed, shotmaking and size, and it's no wonder they are a fan favorite. Then, there's Atlanta, who went from an under .500 8-seed a year ago to a 60-win one seed in the East. You may still not know the name of their coach, but you should. Mike Budenholzer just won coach of the year, and rightfully so. He served 17 years under the brilliant basketball mind of Gregg Popovich, and it seems to have paid off. Much like the Pacers of last season, the Hawks are a blue collar team that exceeds their talent through hard work and unselfishness. Time will tell if veteran big men Millsap and Horford can anchor them to the promised land, but it's definitely an intriguing story line. The Spurs: Dynasty or Debilitation? As the Spurs embark on their title defense and go for their first back-to-back championships in the Duncan era, the question keeps coming up as to when this team will be over the hill. While Duncan and Ginobili don't have many years left, it's been the disappearance of Parker's game that has held this team back. If they are going to keep the dynasty talk rolling, he will have to find his elite form, and find it fast! Or else their chase for a championship banner may be replaced with a retirement banner for Duncan. Can CP3 Finally Do It? There is no doubt that Chris Paul has been one of the elite points guards in the league for some time. But, his legacy remains empty without a championship ring. And, while the task is daunting in the West, if Paul and co. can beat the Spurs, they just may have the battle wounds needed to navigate through the conference and into the record books. Can the Grizz Actually Win It All? That's a good question! This team looked like an early co-favorite with Golden State to win the West. Since, they've taken a nosedive from the 2 seed to the 5. Yet, they still have the bigs and the defense to make a run. They also have their most offensive firepower since Rudy Gay left. It would be a remarkable feat for arguably the most blue collar team in basketball. Can LeBron Bring It Home? For some reason, there hasn't been too much hype lately surrounding LeBron bringing title to the desperate Ohio faithful. But, I have a feeling that if they make the finals, it will be all we hear about. They are definitely the favorite in the east, and it's a story line that will never get old. 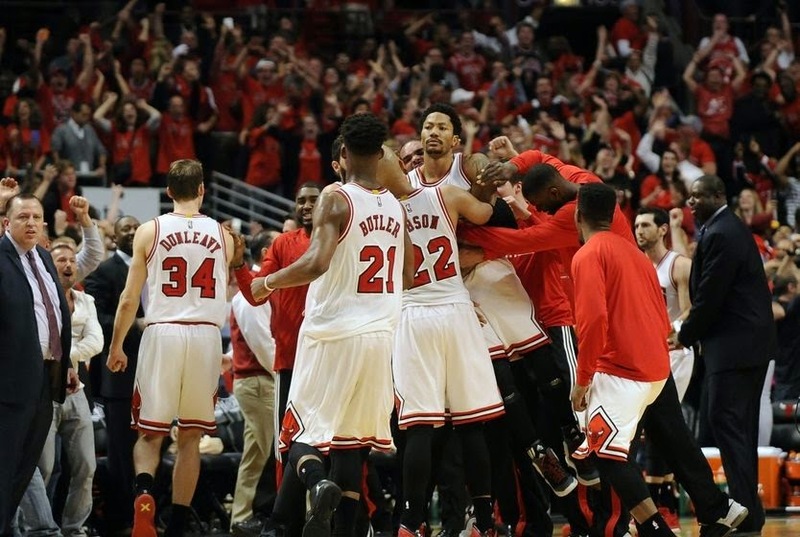 Can the Bulls Finally Win One Without MJ? As the greatness of MJ and all the rings keeps fading away, Bulls fans are left to wonder if they'll ever win it all again. Well, this just might be their best team since MJ's glory days. The addition of Pau Gasol, the meteoric rise of Jimmy Butler and the return of Derrick Rose has Chicago buzzing again. Can they pull it off? Time will tell, but to me, they're the only ones that can stop LeBron from reaching his 5th straight finals. So, this first round may not be as scintillating as we had hoped, but the story lines are still out there. 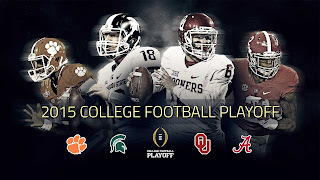 I expect to see some classic games next round, and as the playoffs move on. Enjoy the hoops folks! Many people wanted to see Westbrook and the Thunder in this matchup, but I was not one of them. The man has been almost superhuman this year and is a joy to watch, but it's simply a 1 on 5 show. Need proof? The man scored 54 points against Indiana, a team that missed the playoffs, and the Thunder still lost! Insert the Pelicans, who bring in one of the game's very best players in Anthony Davis. The unibrow may not get the credit he deserves, with his team only getting two national TV games all season. Now is his time to let the world know of his immense talents! Unfortunately, those talents won't be enough. Not even close. The Warriors are on a mission, and the Pelicans aren't in the same league. I've heard from some that my hometown Mavs would be better off facing the Spurs, matchup-wise. You can debate that all day, but I believe one thing we can all agree on is that this is the most fun matchup the Dallas fan base could have hoped for. Between the tirade of Morey and Cuban, Chandler Parsons taking on his old team, and the possibility of an inner-state rivalry brewing, the storylines are very intriguing. The real question is if the actual play on the court will catch up with them. I think it will come close! I know Houston is a top 10 defensive team this year, but I still see this series being a high scoring affair. I think Carlisle can keep this series close, and outcoach McHale. However, the talent of the Rockets should overcome that. Combine that with the health concerns of Parsons and Devin Harris, Dirk being such a liability on defense, and the team's lack of depth, and I think it's just too much. This series could be a classic! Can CP3 carry the clips? Or, will the Spurs continue to defy father time and cement their legacy yet again? The Clips have battled through injuries to Griffin and Crawford to land the 3 seed. Meanwhile, the Spurs made a late charge for home court, winning 11 straight. Ultimately, their loss to the Pelicans in the season finale sent them from the 2 seed to the 6. With home court and Griffin and Crawford back, the Clips may be the safe pick. But, I cannot pick against the Spurs this early. Until they go down, I won't believe they're too old. That has fooled me before. Pop and the crew gets it done. This series will be a real grind, and truly is a tossup. The loss of Wesley Matthews is brutal, and the addition of Arron Afflalo doesn't make up for it. But, Lillard and Aldridge are great, and that home court advantage in Portland is no joke. Then, there's Memphis, who seemed like an early co-favorite with Golden State, only to have a rough stretch and go from the 2 seed to the 5. Ultimately, I think Memphis gets it done. It really could go either way, but I think they excel far more in the half court than Portland, and their experience and bigs will get it done. On paper, the Nets are just as talented. Off paper, they continue to be one of the most underachieving teams in the league. Mike Budenholzer has been a Godsend in Atlanta, providing a tremendous turnaround. He's my personal pick for Coach of the Year, and it's no coincidence that he was an assistant coach under Pop for 17 years. He seems to have picked up every little detail it takes to excel in coaching. The Nets are talented enough to win the series, but reality says otherwise. They are a major letdown, and I have to side with Paul Pierce's recent comments on Deron Williams. He has not been the same player since they moved to Brooklyn and played under the Russian Billionaire's checkbook. Hats off to Brad Stevens. The man doesn't have one all-star, and got his squad in the playoffs. But, that talent disparity will be a major problem against Cleveland. Somehow, it seems the Cavs have flown under the radar. After a rocky start to the season, Cleveland has been phenomenal down the stretch. The trade for Smith and Shumpert was huge, giving LeBron a strong supporting cast. I, for one, will admit that I scoffed at Kidd as a coach. There's no doubt that he knows the game, but I had an issue with how quickly he received a head coaching job. Nevertheless, the joke is on me. He has taken a team with little veteran talent or leadership into the playoffs. On the other side, the Bulls have battled injuries to snag the three seed. I believe the games can stay close, but there's no way I'm picking against the Bulls here. Gasol has been a rock, holding together a team plagued by injuries. However, the team seems to have gotten healthy at just the right time. I'm not sold that Rose can be enough of a difference maker for them to make a deep run, but give me the Bulls in a short series. This is a tough series to call. Lowry has shined in the spotlight in recent playoffs, but I think this is Wall's year to do so. Wall is one of the best guards in the league, but is often overshadowed by others. It's a close series, but I believe Wall will breakthrough, and Pierce has enough big shots left in him to close out close games. This kicks off what should be a fantastic 2nd round of games. This will be a very interesting series to watch, with a real contrast of styles. While the Warriors are run and gun, the Griz want to slow it down and let their bigs go to work. The Griz will make Golden State earn it, but I can't go against the Warriors. They are on a mission, and the Griz just haven't been the same team during the 2nd half of the season. Will Harden finally have his breakout playoff moment? Was Duncan's block of Harden in the final seconds a sign? I believe it was. The Spurs are back, and it's all about matchups. I believe the Clips are a tougher matchup. The winner of Clips/Spurs takes out Houston. Houston has fought through injuries, and Harden has been amazing. But, the playoffs are another animal, and Harden has yet to prove that he is a superstar there. Also, I'm not convinced Howard will ever be a winner. McHale will get outcoached too. Give me the Spurs one more time. The Hawks have had a phenomenal season, but the buck stops here. I know I'm going out on a limb here, but I really believe in Wall and co. I see a bunch of close games, with Washington breaking the hearts of the Hawks faithful. That said, I realize it is a tossup or worse just to get by Toronto. But, I have a feeling here! This should be the conference finals matchup. The two teams have the most talent in the East. To me, this series comes down to if Jimmy Butler can become the Kawhi Leonard of the 2014 playoffs. I think Butler is on a similar path, but after his injuries, I'm not convinced he will have his playoff moment. Preseason, I thought the Bulls were the better team. But, after the Cavs trade and how they've looked, I think they get the job done with home court. This would be a doozy! Preseason, I had the Spurs winning it all again. But, I think dropping to the 6 seed will be too much to overcome. Asking a team to win 3 series on the road in the vaunted Western Conference is too tall of a task, even for the Spurs. It's the Warriors' time. The team of destiny breaks through to reach the NBA finals. These teams had some great battles in LeBron's first tenure in Cleveland. I see this series as less of a clash. The Wizards will run out of gas, and the Cavs are simply too good here. What an amazing finals this would be! How will the moment affect both teams? Two of the most passionate and desperate fan bases get to find out. I think the shotmaking of Golden State will take it in the end. LeBron puts up a valiant effort, but I believe the pressure will get to him. And, it's not really his fault. Golden State is a great team. It's that one defining moment, shot or game that sends feverless fans into a frenzy of unbridled joy, celebrating the heroics of amateurs. It's that cinderella that lights up the dance, even if their fans can only fill a section or two in the arena. No matter how big or small, the NCAA Tournament gives every team who earns their spot a chance. Just in the past couple weeks, we've seen numerous last second swings to determine postseason fates. One came when Belmont punched their ticket with a ridiculous game-winning three in the final seconds to deny favorite Murray St. of an automatic bid, and a spot in the big dance. We love the madness because anything can truly happen. Heck, last year, UConn looked dead in the water in the first game, but scrapped to force overtime and win. Five wins later and they were on the mountaintop. In one fell swoop, you can have your bracket busted, the hair on your arms lifted and your emotions scaling from agony to ecstasy, with your jaw on the floor. This has to be number 1! Last year's wild elite 8 game saw Wisconsin narrowly escaping to deny Arizona coach Sean Miller of his first final four. Now, call it blind luck, fate or some personal committee rearranging, but the two teams look to be in for another elite 8 collision course. Many of the same faces are back, and both teams are loaded. What does the winner possibly get? A battle with Kentucky. Have fun with that! This potential Sweet 16 battle would be just what the doctor ordered if you like high-scoring affairs. It features two fantastic backcourts, as well as an interesting coaching match-up. Iowa State coach fred Hoiberg perhaps exceeded expectations last year after winning games in the dance without star Georges Niang after he broke his foot. On the other end, Gonzaga coach Mark Few has had incredible regular seasons with the team, but has mostly been a bust in the tournament. It would be fun to see who prevails! There is absolutely no way the committee didn't pair these two teams up randomly. Wichita State at 28-4 as a 7-seed smells funny to begin with. Add the state rivalry, bragging rights and ratings, and you have to think the committee had an agenda here. Regardless, it would make for must-see TV, and I'm not complaining! If both win their first game, which is more than attainable, we will see a clash of epic proportions! This one would be a really interesting clash of styles and story lines. Virginia started out as one of the very best teams in America, and even after the injury to their leading scorer Justin Anderson, the team managed to win most of their games. But, the question has always been if they have enough offensive firepower when it matters most. Insert Michigan State, who is much more of an offensive unit than Virginia. With Michigan State nearly beating Wisconsin in the Big 10 final, Sparty is a trendy pick. This game could make or break some brackets! This is a potential championship game, and boy would it feature a bit of everything. Many, including myself, have said that Duke is one of just a few teams that can matchup with Kentucky. The bigger question for Duke is if they can get to this game. Okafor is a star, but his free throw shooting is abysmal, so close games could be a trouble spot for Duke. Duke also must exhibit better defense to reach the final. We will see, but it would be one heck of a final! 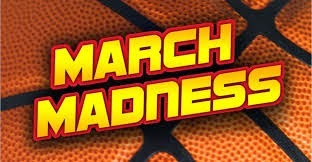 Regardless of if we get these 5 great games, it's the best sports tournament and the best time of year. Sit back and enjoy the show! It should be another action-packed, unpredictable show. 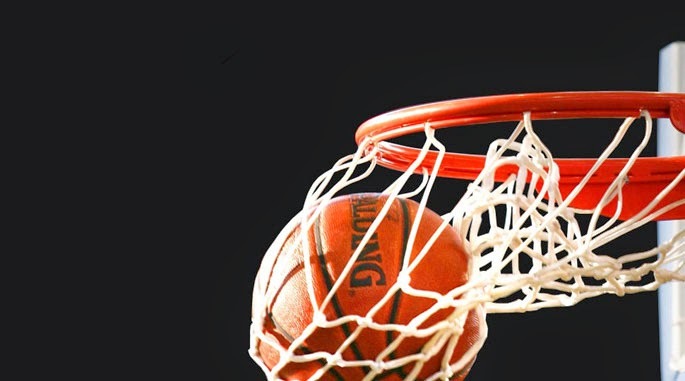 Basketball Bonanza: Bricks or Buckets? After a classic Super Bowl, stale commercials, and likely, a forgotten halftime show, it's time to shift our attention to hoops. All-star weekend has come and gone, and many people are still marveling at the display of Zach LaVine. If you are a basketball enthusiast like me, you probably got out of your seat for some of those eye-popping dunks! After the excitement of his performance wore off, I began thinking about how the rest of the participants, with the exception of one Victor Oladipo dunk, flat out stunk. This seems to be the theme of the contest for years. So, as an NBA fan, I find myself continuing to question why the stars don't show up for the contest, like back in the day. After all, it is the fans that help these players make their astronomical seven to eight-figure contracts, and All-star weekend is supposed to be for the fans. If 8 of the best shooters can engage in a 3-point contest, then give me a handful of the best dunkers! It seems as though players egos and social media has gotten the best of this event, but here's hoping LaVine's performance sparks some of the greats to enter. While this name could make for a great law firm, we are talking about the Golden State Warriors right now. This is a team playing as well as anyone in the league, with depth for days. Steve Kerr, along with two top-notch assistants, Alvin Gentry and Ron Adams, have resurrected the team from last year's debacle. At 42-9 with the best record in basketball, the question becomes if the team can keep up the pace and ultimately, win the conference and the championship. It's a tall task in a loaded Western Conference, but if healthy, they certainly leave little reason for doubt. I said before this year that they would reach the finals within four years, and it might not take that long. The key is Bogut's health. They can get by in the regular season with him being absent, but come May, his presence is the key to defense and rebounding, two of the top keys to winning a championship. Perhaps, they make a move to get even better, dealing a David Lee or an Andre Iguodala to help fill any holes they may have. Okay, maybe I'm overreacting, but the Eastern Conference is light years ahead of the last handful of seasons, in terms of quality and excitement. In a conference that many thought would be a two-horse race between Chicago and Cleveland, the Hawks, Raptors and Wizards have stepped up and made it a real battle for supremacy. All three of these surprise teams are led by three young floor generals and are extremely well-coached. They make up for talent in sheer hard work and will. But, the story line becomes if they can keep it up and topple Chicago or Cleveland? I still believe the Bulls and Cavs are the teams to beat out east. When healthy, they both possess the best collection of players and/or quality experience of any team out east. It is hard for me to envision either losing in a 7-game series to anyone other than each other. But, that's why they play the games! Normally, this is a dreaded spot for the team that lands it, squaring off with the top dog in the conference. But, this year, it may just be the other way around. If Oklahoma City can erase their small gap and grab the spot, it could be the Warriors or Grizzlies who are lamenting the matchup. I still believe the one seed will hold on, but it will take a strong effort to move on. We all know the Thunder are only there because of early injuries, and they've shown signs of strong play of late. Maybe a move by the deadline vaults them into their customary playoff berth. Right now, the MVP is being talked about as a two-horse race between Curry and Harden. I would back the breaks up a bit. With a lot of the season still to play, there's nothing to say that a Rose or LeBron can't take their team on a monster 2nd half run. You know it's a wild NBA when the Clips, Spurs and Thunder all represent the six through eight seeds, three teams who are accustomed to home court advantage in the first round. Throw on top of that the Hawks and Warriors leading their conferences, and you have what seems like a fun and unpredictable four months ahead. My original prediction wasn't so original, with the Spurs beating the Cavs. I will stick with my prediction, as the Spurs are just two games back of the 3 seed, and the Cavs are playing great basketball of late. But, I must say, the west will truly be a war come playoff team, and the east should be competitive too. I think we all thought the Spurs age would get the better of them the last couple years, and until they prove that to be the case, I cannot stray away from their greatness. The NBA regular season may be hard for many to invest time and energy into, but this year seems different. If you are a big fan like me, you're in for a real treat down the stretch. Enjoy the hoops!